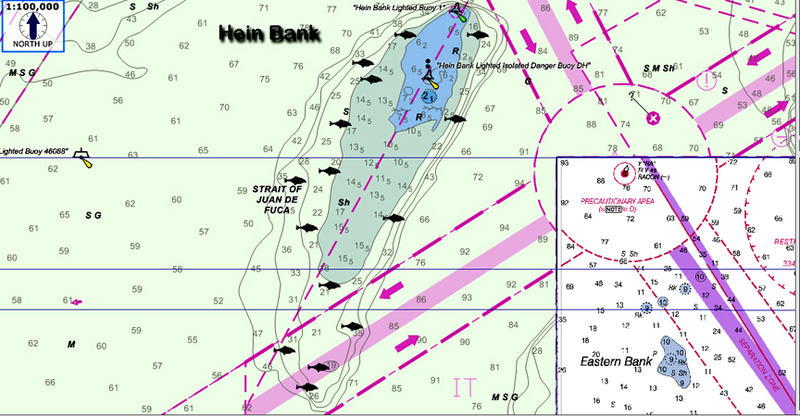 Hein Bank is one of the best halibut fishing spots in the Strait of Juan de Fuca. This easy to find and easy to fish bank offers anglers a vast area to search for and find halibut. Some anglers opt to drift this underwater bank while others choose to anchor on known hotspots. If you choose to drift, watch the current and set up your drift to follow the contour lines. Over the years I’ve had the most success in the 180 to 220-foot range, but have taken fish from 220 to 350-feet. Halibut will also move into the shallows, especially on the northern end, where baitfish get pushed onto the top of the bank. When starting in the shallows look for 30 to 60-feet and keep a watchful eye on your depth sounder as you drift from shallow to deep water. And don’t be surprised if you see salmon on your depth sounder, they too are attracted to this baitfish buffet. Best baits include FAT Squids, herring, squid, salmon bellies and mackerel. When using FAT Squids or any lure always add a chunk of bait to the hook. This sweetens the lure and gives the halibut something to smell and taste. 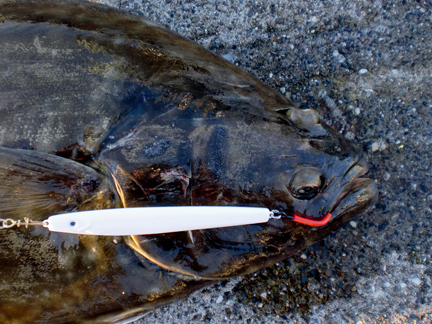 Adding bait dramatically increases your chances of hooking halibut. Jigging for halibut at Hein Bank can be very productive. Jigging with Pt. Wilson Dart jigs, Deep Stingers or leadhead jigs also works great at Hein Bank, especially in the shallow areas. When using leadheads put a chunk of bait on the hook. When using baitfish style jigs put some scent on the jig to make it more appealing. You can also add some UV or Glow tubing to the hook shank to increase the jig’s visibility. Trolling for halibut at Hein Bank also works for some anglers because they can troll along the edge, while maintaining a fairly constant depth. Make sure you have plenty of downrigger cable and a 15-pound downrigger weight. To increase your trolling success, add a two foot length of threaded pipe to your downrigger ball. Drill a couple dozen 1/4 inch holes in the pipe and seal both ends with a screw on cap. Drill a hole through the center of the top cap and install a stainless steel eye bolt that will connect to the bottom of the downrigger ball. Use two to three foot piece 80 to 100-pound mono line to connect the pipe to the downrigger. Before deploying the pipe unscrew the top and fill the pipe with shrimp pellets and then pour some mineral oil, canola oil or herring oil into the pipe, screw the pipe into the lid and deploy. Lower the downrigger ball and pipe to the ocean floor until it “ticks” or drags slightly. This will create noise, stir up the bottom, create a good scent trail and prevent you from snagging your ball on the bottom. It also keeps your bait off bottom and in clear view of any nearby halibut. 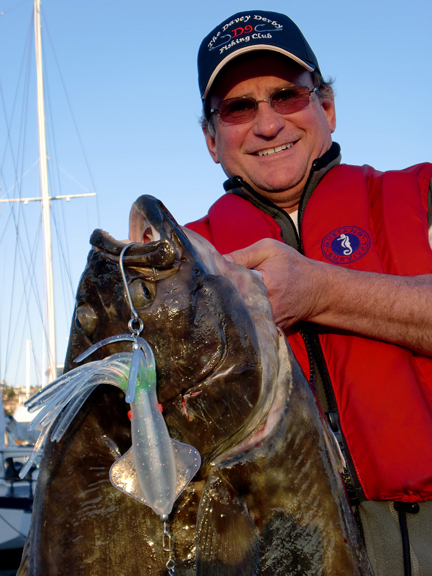 Best bait or lures for halibut trolling include flashers and hootchies, flashers and herring, flashers and Squiddy Squids or a dodger and herring. Leaders should be 80 to 150 pound test and measure four to five feet in length. This entry was posted in Halibut Fishing Tips, Washington Halibut Maps and tagged Halibut Fishing, Halibut Fishing Maps, Hein Bank, Hein Bank Halibut Fishing, Hein Bank Halibut Fishing Map, How to fish Hein Bank, How to Halibut Fish, Puget Sound Halibut Fishing, Strait of Juan de Fuca Halibut Fishing, Strait of Juan de Fuca halibut fishing maps, where to fish Hein Bank for Halibut, Where to halibut fish in Strait of Juan de Fuca. Bookmark the permalink.